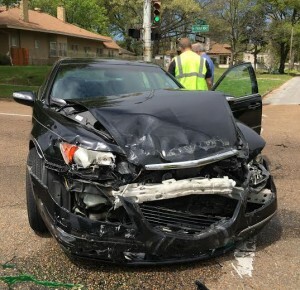 I’ve been in a bad wreck but think I’m OK—on North Parkway at Dunlap. When I arrived (in about 3 minutes) and saw his car, I burst into tears. Memories of my wreck almost three years ago came flooding back into my head and heart. But I ran over to where Bill was talking with the emergency responders and saw that he was, indeed, fine. What happened? 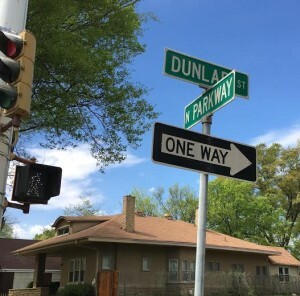 A woman entered North Parkway from Dunlap on the north side of the street, going south—where it is a ONE WAY street going north. 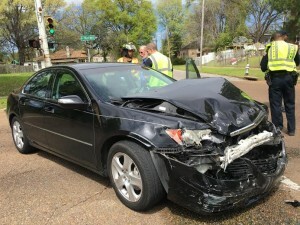 Her car was also in bad shape, but thankfully neither she nor my husband were seriously injured. Bill only has a few bruises, thank God. Thank God. We say that almost flippantly all the time, don’t we? Even people who aren’t religious say it, especially when expressing relief over something that could have been much worse. The baby was born prematurely but she’s going to be fine, thank God. His cancer is in remission, thank God. She wasn’t shot in the terrorist attack, thank God. But yesterday and today those words are much more than a platitude for my husband and I. Last night when he finished his evening prayers—which he says in front of our icon corner in the dining room—and came to bed, I asked him again if he was okay. He said he was just thanking God for keeping him safe and unharmed. As we move forward, dealing with insurance (the other driver has insurance, thank God) and considering new car shopping, we both have thankful hearts and a new appreciation for life. For God. For angels. Yes!! God’s angels were with him yesterday! Thanks for joining in, David. Saying a prayer of thanksgiving for y’all….God’s blessing on the 2 of you ! How horribly restimulative that must have been for you. Be well, safe…. oh my! I imagine you relived your experience just by looking at that car! Bless you both!! Bill and I have talked about our wrecks, the difference being that I DON’T remember the moment of impact in my wreck, which was late at night on a dark road. Bill remembers thinking, “this is going to be a bad wreck” and trying to put on his brakes….